Do you like to eat healthy and enjoy the benefits of organic raw food and vegan and gluten free options. 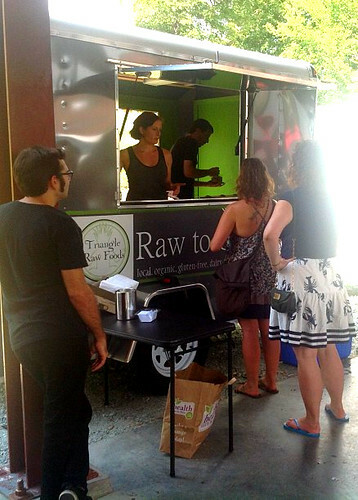 These are not always the easiest types of food to find, but we are lucky enough to have a business like Triangle Raw Foods (TRF) here in the Triangle to help meet this need. 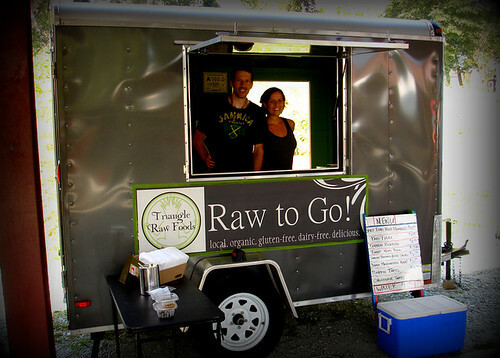 Triangle Raw Foods was started by Chef Matthew Daniels and Jane Howard Crutchfield out of a mutual love for health and good food. They embody the raw food movement by providing organic, gluten-free, vegan raw food options to our community using as many local, organic ingredients as possible, and really value the importance of supporting our local economy. TRF has steadily grown over the past two years from a weekly delivery service to a food truck, and they are now looking to expand and open their very own prep kitchen and café space where they can prepare and serve their raw-food, vegan, and gluten-free offerings. The TRF food truck has been a huge part of thier growth, but they are ready to grow and take things to the next level. 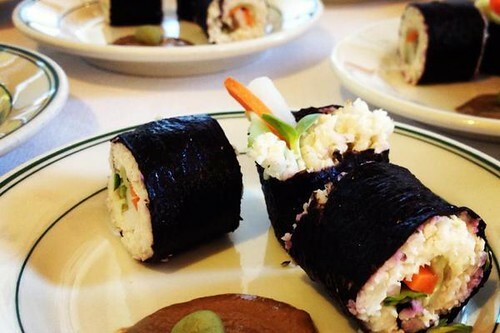 Their long-term goal is to be able to serve freshly prepared raw food meals in a small cafe setting. Matthew and Jane plan to host pop-up dinners and raw food prep classes in their new café, and envision TRF becoming a place for community members to swing by for a quick healthy bite or pick up food to go. Before they can do that,they will need to build and equip a commercial kitchen. TRF has set up a community fundraising campaign online with Indiegogo with the hopes of raising the necessary $25,000 needed to cover the basics of the expansion. To learn more about TRF’s vision or to contribute to their campaign, check out their video below and visit their Indiegogo fundraising site here. – Equipment: commercial dehydrators, commercial food processors, high speed blenders, refrigeration, counter tops, sinks, immersion heaters, dishwasher, etc. -Building the space: materials, plumbing, electricity, permits, getting everything to health code. Besides getting an awesome place to come enjoy a fresh raw food meal or raw food to go, you will be a huge part of helping to create the Triangle’s VERY FIRST all raw prep kitchen and small cafe! Plus, there are some other great perks for being a supporter! Mathew and Jane want you to have the opportunity to get back what you give, so they are offering discounts and other rewards to their supporters. Every little bit helps, so please consider supporting the TRF Indiegog campaign and sharing news about Triangle Raw Foods with your friends and family. Their kitchen & cafe’ will be an amazing addition to the Triangle we can all enjoy!